With the speedy development around Sungkai area due to the presence of the new “shortcut” to Kuala Lumpur,more and more foodies are thronging the area in search of hidden gastronomic treasures. Honestly,this sleepy hollow of a town does has plenty of fantastic eat outs awaiting to be discovered. We were on our way to Colmar Tropicale,Bukit Tinggi,and upon chance we chose to have breakfast at this little gem of a old kopitiam. Little antique coffeehouse.The board must be decades old. 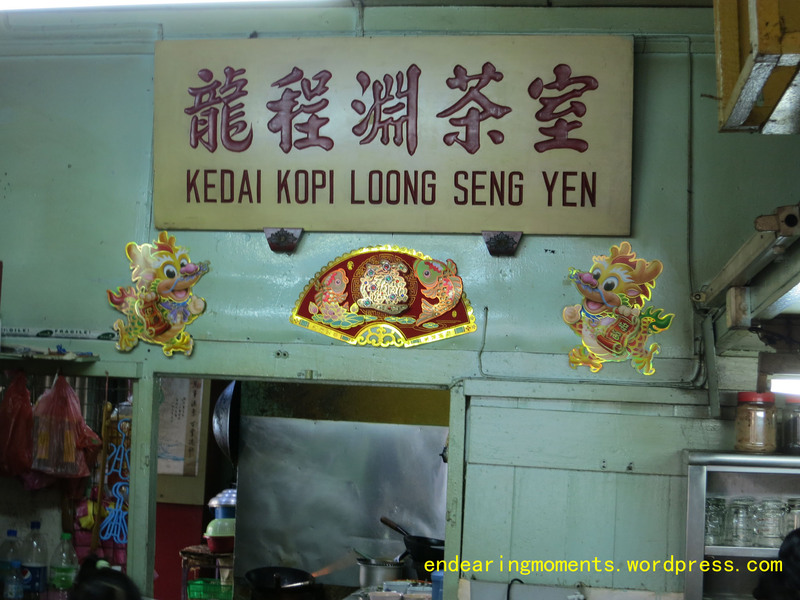 The name of the shop is Loong Sen Yen,located at Sungkai town.For a map and info on getting to the town do click on our previous food review. 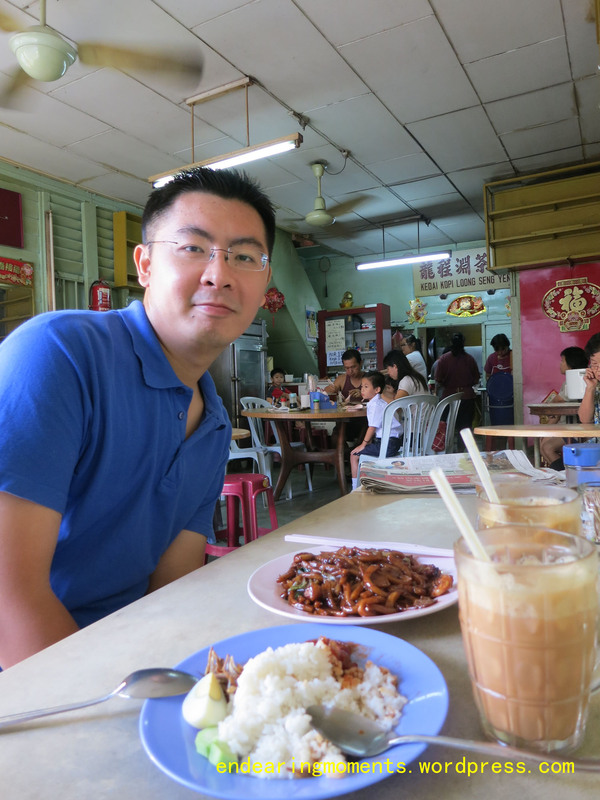 As with all Hainaneese kopitiam( coffeehouse in local dialect),they serve the staple of Malaysian favorite breakfasts. We ordered two of the most popular according to opinions of loyal customers. Happy posing with the glorious platter. First up- Nasi Lemak (malay) which can be literally translated as fatty rice ! No one knows who exactly invented the dish,or named the dish.But its has been an integral part of the Malaysian food heritage for a long time,even before pre-colonial times. It is now the gold standard of every coffeehouse in Malaysia.If a coffeehouse can’t make good Nasi Lemak,they might as well close shop. It is so ubiquitous and popular,it has become to be symbol of Malaysian cuisine and pride. For example,Pizza=Italy,Sushi=Japan,Curry=India,Nasi Lemak= Malaysia.Some even argue that “if you don”t like Nasi Lemak,you are not a True Malaysian.” But seriously,all Malaysians regardless of race savor a good plate of Nasi Lemak ! Since Malaysia is the homeland of Nasi Lemak.The bar is set skyscraper high.And,surprisingly,this ordinary looking plate shot higher than the KLCC. 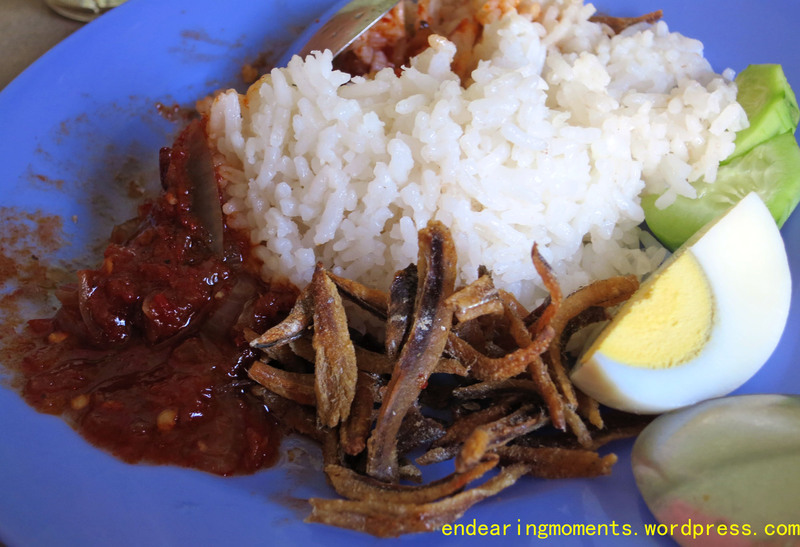 Crispy anchovies,zesty sambal,sweet and creamy rice,refreshing cucumber slices-the perfect Nasi Lemak! Next,we ordered Hokkien mee. 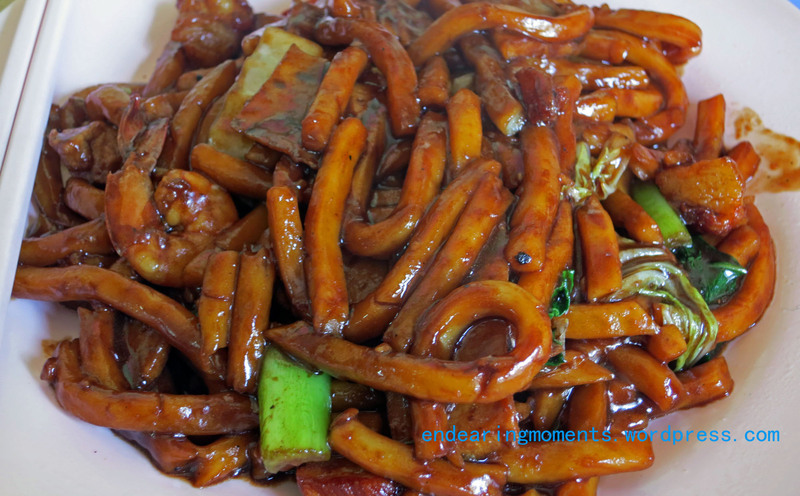 ( thick noodles hokkien style). This is the signature dish of the shop. The dish consists of think noodles(could be substituted with Udon noodles) ,stir fired in a creamy gravy.The gravy was a splendid mixture of thick soy sauce,sesame oil,some secret seasonings and lard.Both the sliced pork and prawns were cooked just perfectly.And the portion given,was a generous offering considering the price. Another special point is, the whole stir frying process was done with charcoal stove.It might be psychological,but the stir frying on the blazing charcoal was quite dramatic and hence the enhanced taste. Savoury gravy, al-dente noodles,sweet pork slices, flavourful prawns,crispy carrot and mustard greens all make into a mouthwatering dish. To wrap it off,we give this little old Kopitiam a 5 star. Great food,superb hospitality,affordable price,full of beauty of yesteryears. Although it is a little run down,the atmosphere of dining at such an old place,transports you back to the 60s or 70s.The antiques cups,plates,and furniture all exudes a sense of closeness,bringing you down memory lane with each sip of coffee and each spoonful of fragrant Nasi Lemak. Jen posing in front of our great discovery.What a wonderful breakfast we had. A great memory to cherish. Do pay this coffeehouse a visit whenever you guys have the chance.Who knows when the town municipal will tear it down to pave th way for development. 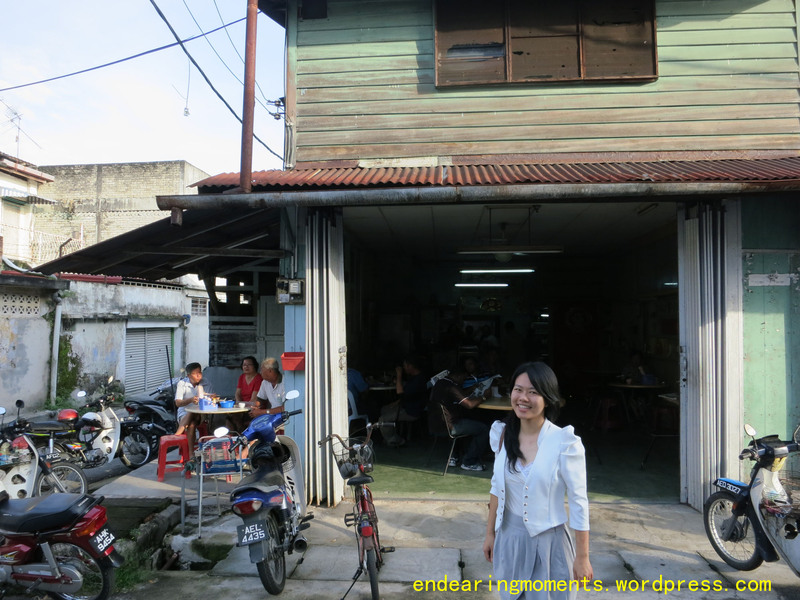 If possible,we from endearingmoments would want the local government to preserve the coffeehouse as a local heritage.There are not many antique coffeehouses that still serves great food left in Malaysia,this is definitely one of them. In the meantime, enjoy !